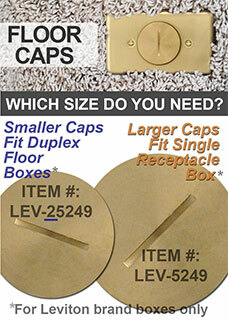 Find replacement switch plate caps for recessed outlet covers mounted in a floor or mantel. 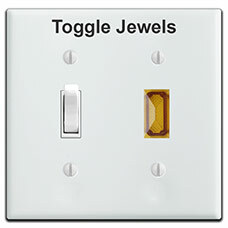 Buy jewels and lights for wall switch plate lamps and for pilot lights on toggle or single outlet cover plates that help alert you to electrical devices and motors that are still running, such as pond pumps, fountains, outdoor lighting, and more. Wire a lamp to a switch inside your electrical box, add a jewel to the cover plate, and stay alert that electrical devices are on. Perfect for pond pumps, outdoor fountains & back yard property lighting. Buy a pilot light cover plate with a jewel. Jewels also come as rectangles to fit toggle switch plate openings. Available in amber, green, clear and red above. A light inside a wall box can also be covered using louvered cover plates. These plates allow the light from the bulb to shine through the slats in the plate. The perfect way to light outdoor steps at night. Shop covers with horizontal louvers. Be sure to see our replacement floor cap ordering tips - check the brand and size of the cap you need prior to placing your order. Our caps fit Leviton devices and come in 2 sizes - smaller for duplex receptacles (2 oval plugs) and larger for single round receptacles.